Do you worry about your parent’s safety? Find yourself rushing home to feed the kids or grandkids? Worry about how they would cope without you? If you answered yes to these questions, you may find you are part of the sandwich generation. 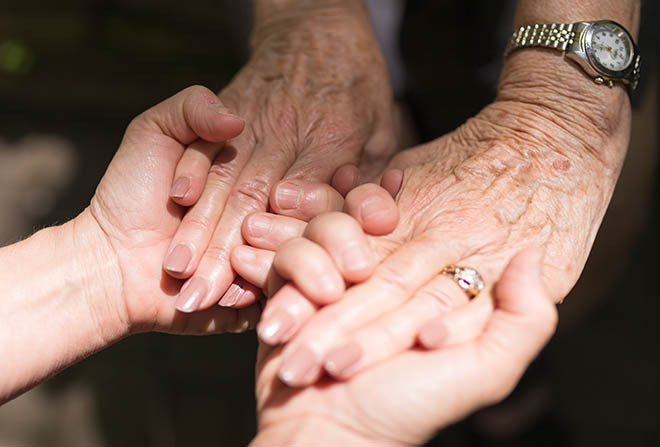 Caring for an elderly parent while raising a family is a real-life dilemma that faces many women of the sandwich generation. Worry and guilt can be some of the emotions that are experienced and many don’t even realise they are their parent’s “carer”. With 1 in 4 carers reporting symptoms of mental ill-health, the strain can take its toll and it’s important to know that you are not alone. Carolyn Knight experienced the daily struggle first hand when her mum, Marlin, started to become unsteady on her feet. 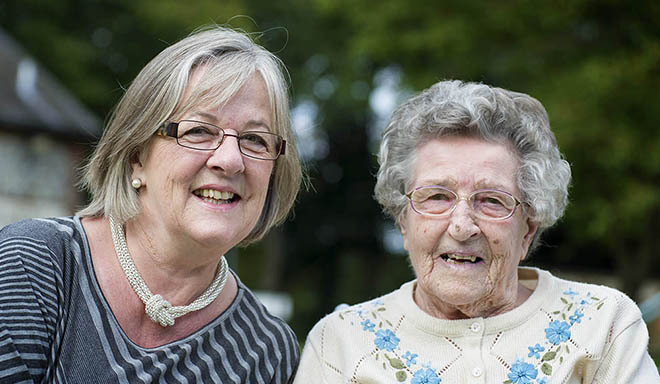 Wanting to retain her independence, Marlin found day to day living a struggle and this was a constant worry for Carolyn who regularly fretted about her mum’s safety. “Every time I showered her there were more bruises from where she had bumped into things. She had spilled boiling water from the kettle and things like that were worrying her, even though she wanted to keep her independence,” Carolyn shared. Regularly making the 60-mile round journey to her mum’s home, Carolyn found that quality mother and daughter time had all but vanished. Instead, it had been replaced with the endless tasks of survival. Things like bathing, cleaning and getting in the food shop dominated their routine and changed the dynamic of their relationship. With a third of the sandwich generation admitting to struggling, Carolyn is not alone. Thinking about her mother’s safety played on her mind regularly. There was an ever-present fear that something could happen from the goodnight bedtime call to the next time they spoke. “I was very anxious leaving her. When I phoned at night she still could have put the phone down and then had an accident and hurt herself and I wouldn’t know if something had happened,” Carolyn explained. Suddenly Carolyn’s fears became a reality when Marlin suffered a serious fall. After trying to drag herself across the floor towards her safety pendant that had been left on the sofa, Marlin caused further injury to her leg. There was nothing left to do but wait for help to arrive and after 16 hours of lying on the floor, her cry for help was heard. Assessing her injuries, doctors advised that Marlin’s leg injury required long-term care and it became evident that returning home was no longer a possibility. Alternative action was needed. Sanctuary Care’s Watlington and District Nursing Home in Oxfordshire provides intermediate care and support for people following a spell in hospital, as well as supporting those with nursing and dementia care needs, and they were able to offer Marlin a place. “Mum was initially upset as the decision was out of our hands and she had no idea that when she went to hospital that day she would never return home,” said Carolyn. However, in Carolyn’s mind there as a quiet sense of relief. Despite her reservations about moving into a care facility and her independence being threatened, Marlin very quickly fell in love with her new life and embraced the change. Becoming surrounded by new friends and support staff meeting all her care needs, Marlin’s social life boomed and the pressure on Carolyn lifted. With the role of a daughter being reinstated, quality mother and daughter time had returned. “It is a totally relaxing situation because I know she is being cared for, she is enjoying the company, the food, and the activities. It is also great because I can join her when she goes on trips or we can just sit and chat. Now it is ‘our time’ again. Joining her when she goes out and seeing the pleasure she gets, it makes me quite tearful because we are able to do things now that I couldn’t have done with her before,” Carolyn said. And what does Marlin think of her new life? “It’s the friendliness of everyone – and I love having my hair done every Friday. It makes me feel like I am going to Buckingham Palace!” exclaimed a rejuvenated Marlin. With the help of Watlington’s minibus and staff, it wasn’t long before Marlin took a special trip to Buckingham Palace for real with her new found friends. Further information on Sanctuary Care and how they can help you, can be found here.